Maj. Gen. Patrick Higby, a 29-year U.S. Air Force official, has been named director of information technology acquisition process development at the Office of the Assistant Secretary of the Air Force for Acquisition. The Defense Department said Friday Higby will leave his roles as director of cybersecurity strategy and policy at the Office of Information Dominance and chief information officer at the Office of the Secretary of the Air Force. 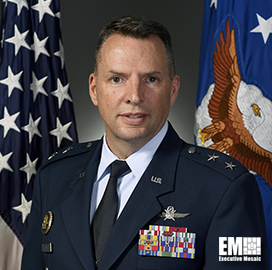 As cyberspace operations and support career field functional manager, he oversaw 43,000 officers, enlisted and civilian personnel, as well as the costs and risks of cyberspace initiatives within the Air Force. He also previously held other roles in the service in the engineering, intelligence, space, communications and cyber career fields, at base, major command and joint agency levels. Higby entered the Air Force in 1989 as a squadron section executive officer at Fort George G. Meade, after graduating from the Reserve Officer Training Corps.